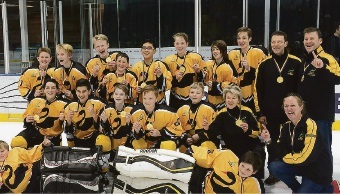 THE WA Ice Hockey Under-13’s team took out the competition and won gold at the National Ice Hockey Championships. The competition ran from August 11-14 in Melbourne, where the team played seven games against other states and territories. WA beat New South Wales in the semi-finals to advance to the finals, where they thrashed Victoria 4-1 to clinch the Phil Ginsberg Memorial Trophy. Head coach and Carine resident Sandy Langille said the team also won the fairest team award, which indicated the lowest penalty minutes. “The cornerstones of the team’s success were teamwork, respect, having fun and hard work,” she said. Ice hockey is played at three rinks across the Perth area: Malaga, Mirrabooka and Cockburn.